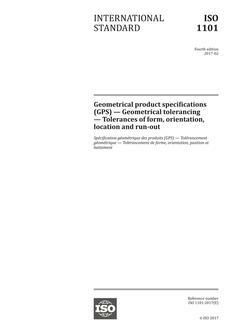 This document establishes complementary rules to ISO 1101 to be applied to pattern specifications and defines rules to combine individual specifications, for geometrical specifications e.g. using the symbols POSITION, SYMMETRY, LINE PROFILE and SURFACE PROFILE, as well as STRAIGHTNESS (in the case where the toleranced features are nominally coaxial) and FLATNESS (in the case where the toleranced features are nominally coplanar) as listed in Annex C.
These rules apply when a set of tolerance zones are grouped together with location or orientation constraints, through the use of the CZ, CZR or SIM modifiers. This document does not cover the use of the pattern specifications when the least and maximum material requirement is applied (see ISO 2692). This document does not cover the establishment of common datum (see ISO 5459) based on pattern features.